To protect the research and privacy of the customer who paid for our Expression Vector Preparation Service, the name of the gene promoter and researcher are held confidential. 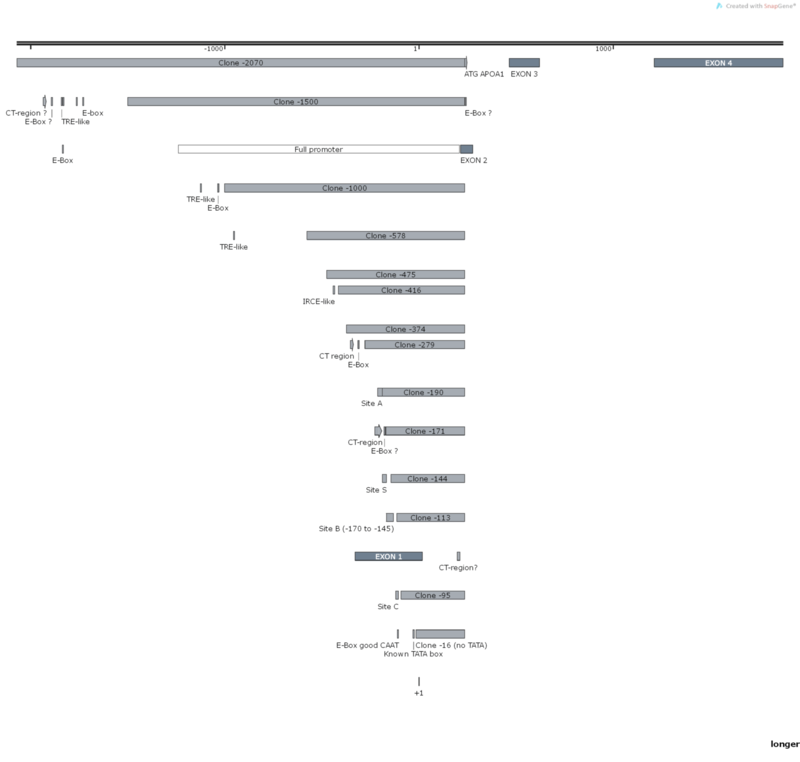 This cloning project originated from a lead found while supporting the 31e Congrès de la Recherche – CHU Ste-Justine back in May 2016.
performing the cloning of 12 segments (truncation method) into the TK-LUC expression vector provided by the researcher. We’ve analyzed the sequence of the promoter region of the researcher’s gene of interest and have designed a truncation strategy that would enable him to find key regulatory regions within this promoter. Because none of the promoter truncation sequences contained either the restriction sites Sal I or Bam HI, we deisgned forward primers to contain a Sal I restriction site + 6 floating bases in its 5′ sequence (5′ of PCR products). 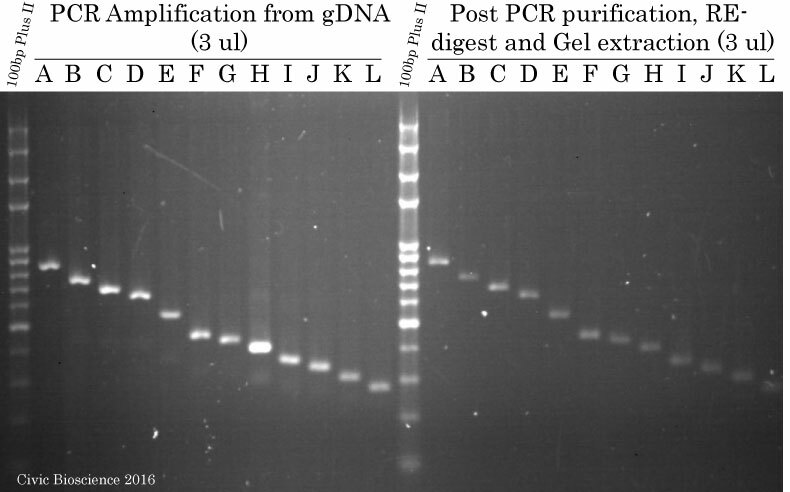 The reverse primer was universal for this cloning stategy and contained a Bam HI restriction + 6 floating bases in its 5′ sequence (3′ end of PCR fragments). Promoter fragments were amplyfied by PCR using TransStart FastPfu (High-Fidelity) DNA Polymerase from purified human genomic DNA obtained from PCR Success Story #8. Subsequently, each amplicon was purified on column using the FavorPrep GEL/PCR Purification Kit, digested using FlyCut Sal I and Bam HI and finally gel extracted using the same FavorPrep GEL/PCR Purification Kit. Samples (3 ul) were run on a 1.6% agarose gel stained with ethidium bromide. 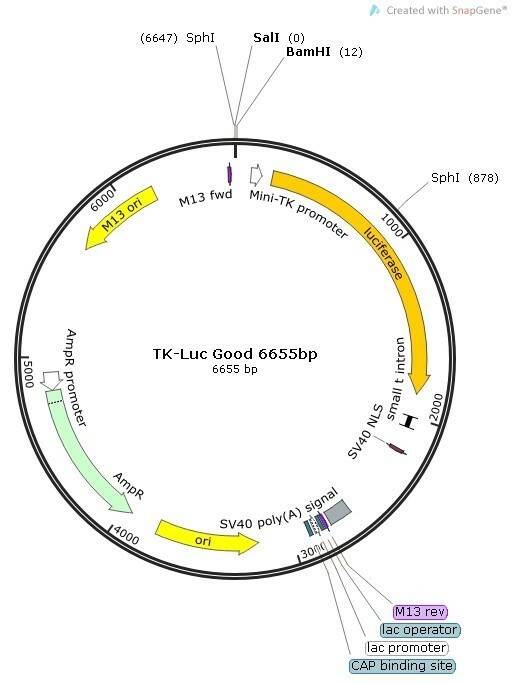 After also digesting the TK-Luc vector with Bam HI and Sal I (Bam HI-TK-Luc-Sal I), followed by gel extraction, the vector was ligated individually to each of the 12 Sal I-fragments-Bam HI using T4 DNA Ligase. Ligations were then transformed into Trans1-T1 Phage Chemically Competent Cells. The next day, colonies were screened by colony PCR using EasyTaq DNA Polymerase and then chosen colonies were picked up for plasmid miniprep DNA extractions. 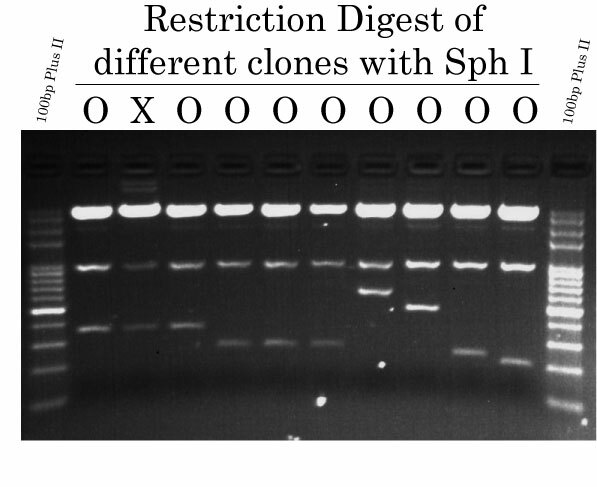 Restriction digest analysis was performed using FlyCut Sph I to determine wether the plasmid preparations were constructed as intended or not. Restriction digest were analyzed by agarose gel (1.8%) electrophoresis. Plasmid miniprep were sent out for sequencing at La Plateforme de Séquençage du CHUL in Quebec City and then sent out to the researcher with all maps, sequences, minipreps, glycerol stocks.